The four Pevensies help Caspian battle Miraz and ascend his rightful throne. Narnia…the land between the lamp-post and the caste of Cair Paravel, where animals talk, where magical things happen…and where adventure begins. Peter, Susan, Edmund and Lucy are returning to boarding school when they are summoned from the dreary train station (by Susan’s own magic horn) to return to the land of Narnia — the land where they had ruled as kings and queens and where their help is desperately needed. 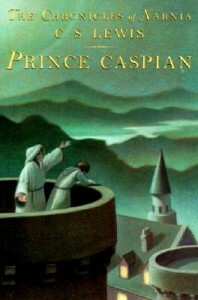 When the movie Prince Caspian came out, I watched it without having read the book, so I had zero expectations. All I thought after I watched the movie was it was a little bit long, and I squeed when Aslan showed up. I didn’t really like it as much as the first movie on the first watch but it got better when I watched it for the second and third time. Eventually, Prince Caspian became one of those movies that I like watching over and over again, despite my friends’ complaints of it not being faithful to the book, etc, etc. But how many times have we learned that movies are never equal to the books, and that Hollywood will always, always change something in the book for reasons we do not know and still get angry about? Anyway, so I finally read Prince Caspian just before the year ended. From the initial impressions of my friends who read the book before watching the movie, I was prepared to see glaring differences compared to the movie. I wasn’t sure what I’d like more, of course, but I’ve learned to read with an open mind. I was surprised to find out that there really wasn’t much difference. Well, okay, it is different in terms of how the story flowed, and how the sequences were made and how dark it feels and the romance (yes, it never existed in the book). But I can see why the movie people diverged from the book. Prince Caspian is not really an exciting book. While there was a battle, many struggles for both Caspian and the Pevensies, and even some black magic, the way it was written just doesn’t shine as much as The Lion, the Witch and the Wardrobe. A Lewis fan and friend told me that Caspian is the book he tends to skim over, and while I didn’t really skim through it, it did prove to be very fast reading as I got through 3/4 of it while I was getting my hair done in the salon. Then I stopped so it took me a while to actually finish it. But I’m not saying that Prince Caspian is a bad book. It just wasn’t exciting as its predecessor. * There were no extravagant rescues, there were no betrayals or resurrections. My favorite part, as always, was when Aslan showed up. It wasn’t quite like how it was done in the movies, but I liked how Lewis wrote it so that the other Pevensies didn’t see Aslan immediately because of the fear that was in their hearts. That’s the same in our faith walk, don’t you think? We can only see God when we let our fears go. And once we see Him, things will never be the same. * NOTE: I must say that I am reading the Narnia books in order of publication, so when I say predecessor, I meant The Lion, the Witch and the Wardrobe and not The Horse and His Boy. I know a friend who did not like the series very much including Prince Caspian. The only one she liked among the series is The Lion the Witch and the Wardrobe, so it kinda put the Chronicles of Narnia set way down my wish list. One skill bookworms has to master is the thinking that books and movie adaptations as separate entities. I haven’t learned that skill, though, as I still frequently get disappointed with the movie-adaptations of my favorite books. I don’t get why they sometimes change too much when the original material they have is already great(yes, The Lightning Thief, I’m looking at you!). Ah Lightning Thief. I wasn’t very disappointed (hello, Logan Lerman) but I know some of my friends were. I second the “hello Logan Lerman” :P (he might have been the only redeeming factor. And oh, Pierce Brosnan. Hihi :P) At times though it could go the other way, where having seen the movie adaptation first, spoils the book. It happened to me with Dan Brown’s Angels and Demons. Aw movies spoiling books is a mean thing. I always try to read the book first if I am interested in a movie. I read “I Am Number Four” by Pittacus Lore because the trailer totally caught my attention… well now I am even more looking forward to the movie because I expected this book to be much better! I don’t know if I should still read this one since I already watched the movie too. I’ve read all the Narnia books, and I’ve gone through them in order! Hehehe. But looking back, I don’t recall any of the books having a significant impact. I barely remember what the other books are about, except for The Lion, the Witch, and the Wardrobe, which I absolutely loved. I guess I’ll reread them to better appreciate them. No, not really. I like them just the same, except that the movie has more exciting moments compared to the book. feel like I’m missing out.